24/7 live video streaming. See your home on your phone in 1080p HD. 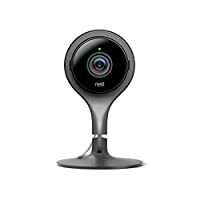 And control Nest Cam from anywhere. Alerts on your phone. Get motion and sound alerts so you now if anything happens. Night vision done right. See the whole room at night - not just a limited spotlight view. Talk & Listen. See your dog on the couch and tell him to get off. Don't miss a thing. Subscribe to Nest Aware to get 24/7 continuous recording and powerful cloud algorithms that give you personalized alerts. Every camera comes with a free 30-day trial.